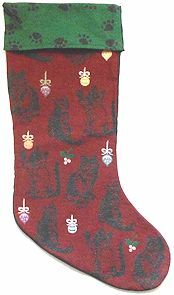 This red and green Christmas stocking features various cat breeds detailed in black on a red tapestry background. The stocking is 19" high x 8" wide at the top. Sample purchased at a sample sale. New.